Over the past few weeks, our President and the Administration have proposed rolling-back environmental initiatives in the form of a proposed new rulemaking for Federal CO2 and fuel economy standards, recommending freezing automotive efficiency targets between 2020 and 2026. Both the EPA and the NTSA are also submitting agency acts to revoke a California waiver that allows the state to set its own regulations. We believe this proposed legislation will be challenged in court on multiple fronts. Firstly, 13 states follow the California Zero Emission Vehicle (ZEV) mandate, and state legislators will point to the economic, environmental and health benefits of the CA policy. If California ultimately wins the case, the automakers will balk, as they do not want a complete elimination of the standards, nor do they want to design for two domestic markets. Most importantly, 2026 on the automotive design cycle is almost here tomorrow. The domestic auto manufacturers, most importantly GM are dedicated to electric vehicle (EV) manufacturing, and have significant plans for global EV development. Corporate Average Fuel Economy (CAFE) standards matter in the U.S., but China matters more as we believe it will be half the global EV market by 2030. The U.S. is not the global driver for the EV market, nor the general automotive market for that matter. In summary, we believe the proposed standards to limit automotive mileage standards will be drawn-out in the courts, while the automotive industry continues to move with safer and more efficient vehicles, leveraging new and disruptive technologies. Would Detroit like to revert to the days of the buggy whip? They surely do not want to lose market share to Chinese auto manufacturers. The second proposed environmental roll-back seeks to dismantle the Clean Power Plan (CPP) structured by the prior Administration. The CPP by the way was never enacted, as it was put on hold by the Supreme Court in 2016. While our nation lacks federal, binding policy on climate change and carbon emissions, disruptive technology continues to drive adoption because costs are decreasing, and new energy sources make better business sense for electric utilities. 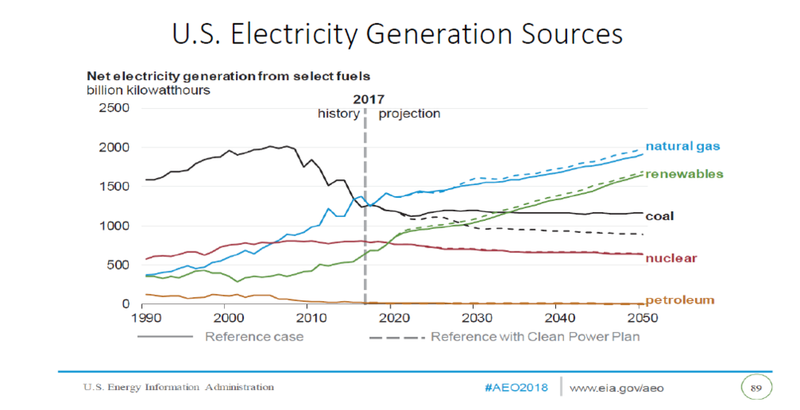 The chart below from the Energy Information Administration shows the rapid decline of coal as a power source, as natural gas and renewables have taken share the past several years. Note while the transition from coal in the absence of the CPP would be slower, and depicted in the model below, we believe the trend will continue as renewables continue their cost and efficiency benefits. You should carefully consider the Fund’s investment objectives, risks and charges and expenses before investing. This and other important information is contained in the Fund’s prospectus and summary prospectus, which should be read carefully before investing. To obtain a fund prospectus or summary prospectus, call (800) 700-9929. The Fund is distributed by Ultimus Fund Distributors, LLC. Investing involves risk, including loss of principal. There is no guarantee that the fund will meet its investment objective. Because the Adviser’s GEOS criteria exclude securities of certain issuers for non-financial reasons, the Fund may forego some market opportunities available to funds that do not follow the environmental themes inherent in the GEOS strategy. As of 6/30/18, the Fund's top ten holdings are TPI Composites Inc. (4.26%), Kornit Digital Ltd (4.15%), Lindsay Corp. (3.55%), Itron Inc. (3.52%), Umicore S.A. (3.47%), Xylem Inc. (3.34%), Trimble Inc. (3.33%), Kingspan Group plc (3.26%), Raven Industries, Inc. (3.20%), and Keyence Corp. (3.18%).